Workforce Solutions Borderplex is dedicated to helping the people of our community join the workforce. Whether you are getting back into the swing of things or obtaining a job for the first time. They have made it their mission to provide help finding necessary resources to enable and empower individuals from all walks of life. Stanton Street and Mithoff Burton are dedicated to serving all businesses big and small within our community. 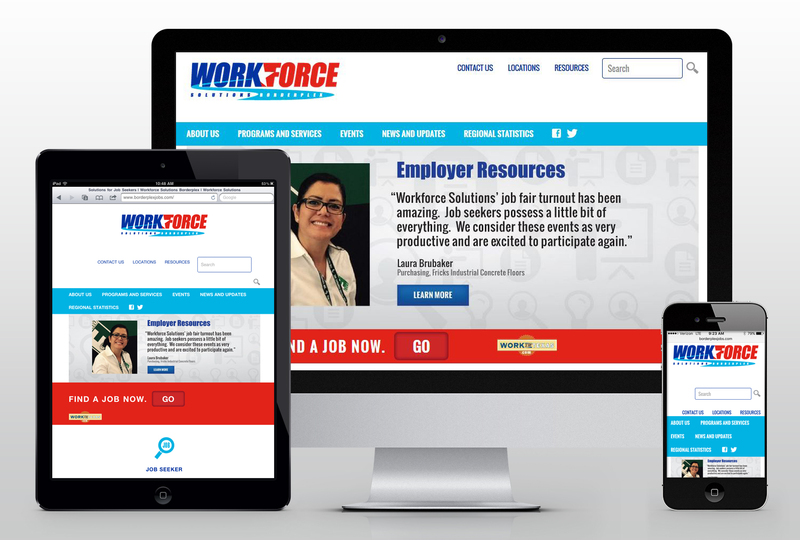 WorkForce Solutions wanted to rebuild their online presence, remain professional, and have a little bit of fun in the process. Design and development are important when creating a website. Who best to handle the challenge? Stanton Street and our good friends at Mithoff Burton. This isn’t the first time that we have partnered with great agencies in our area and like Workforce Solutions Borderplex we are committed to working together to make El Paso great. Mithoff Burton and Stanton Street are creative geniuses and that’s evident when viewing the new homepage as you’re eager to dig deep into what WorkForce Solutions Borderplex has to offer. You are given the option to choose what category you might fall into. Whether you are a job seeker, veteran, student/youth, or an employer looking for help, you will find what you’re looking for. When clicking on a specific category you are given a slew of options that make you feel confident and ready to handle the job force. As a student you are able to find part-time work opportunities that fit into your busy schedule. High school graduates, dropouts or students are able to find information on employment and training assistance quickly. Perhaps you are interested in learning about career opportunities in science, technology, engineering, and mathematics. You are able to do so all in one quick and easy place. As a veteran you are able to learn about work opportunities for either part-time or full. You are given the resources to help you get education and training on employment opportunities. As an eligible working veteran you are also given access to childcare that may be at no cost to you. No matter what path your life has taken you have access to any and all upcoming events that may help you land the career you are looking for. Each category is also broken down into three easy quick start steps that will help you get moving on your new career path. The navigation tabs at the top of the website make it easy for you to get around. You are able to learn about the great people at Workforce Solutions, how they are funded and the surrounding area that Workforce Solutions Borderplex serves. Learning about the Mission, Vision, and Strategic Goals their organization has really makes you feel like they are on your side and they want the people of our community to succeed. You are able to find Regional Statistics, Workforce Trends and Annual Reports put together by this great organization. Maybe you are less about data and more about personal testimony and success stories. Their social media pages are also easy to access from their homepage. You can instantly connect with people that have used their resources to find careers in various fields. It is also a great way to get up to the minute information about any up and coming events. You are also able to contact various resources and departments from accessing the homepage. No matter what direction your life has taken you Workforce Solutions Borderplex can help you find the perfect career that will allow you to become a valued member of our community. Stanton Street and Mithoff Burton have helped make Workforce Solutions Borderplex a place online where people know that they can rely on because of the level of professionalism and fun that they will have in an often difficult time. Have You Picked Your Major Yet?